The zombies are up to their old brain-munching ways again in Endless Zombie Rampage 2, a sequel to top-down undead shooting game by developer Diseased Productions (Eternal Red, Thing Thing 4). 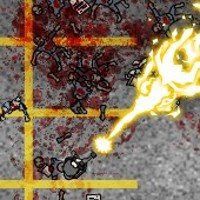 Like the previous game, Endless Zombie Rampage, players are tasked with gunning down increasingly difficult waves of animated corpses, using an ever-expanding arsenal of weapons. However, many notable improvements have been made since the first installment. There are three available gameplay modes. The meat-and-potatoes portion of the game is called “Endless Rampage Mode.” You’ll begin each day by selecting one of three mission types: kill zombies, find supplies, or search for survivors. The “kill zombies” mission type simply gives you a total number of zombies to kill for an experience bonus. The “find supplies” mode asks you to search the surrounding area and retrieve a crate of supplies. The “search for survivors” mode asks you to find a survivor and lead him back to base. You can use money and experience that you earn by killing the undead and completing objectives to purchase new weapons and upgrade your existing ones. With nearly 60 available perks (ranging from weapon-specific upgrades to faster movement speed), and 14 different weapons (from pistols to a flamethrower), you’ll never run out of new ways to slaughter the creatures of Hell. The variety of upgrades, monsters, and mission-types are the game’s strongest suits. The game also includes a “Survival” mode, which is basically like a never-ending “kill zombies” mission from “Endless Survival Mode.” “Experiment Mode” is a sandbox mode that gives you access to all weapons, upgrades, and zombie spawn options. It’s a good mode to use if you just want to mess around. Endless Zombie Rampage 2 is fun to play, and offers a bit more variety than your standard shooter. The weapons are satisfyingly implemented, and the use of persistent blood spatters and corpses means that the battlefield will become increasingly stained with carnage as you blast away. It’s bloody-good fun.